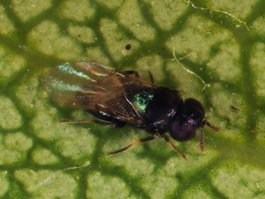 Trechnites insidiosus is the dominant parasitoid of pear psylla throughout western North America. It has been little studied because of its small size and because it is rarely found in pear orchards sprayed with organophosphate insecticides and other quick acting nerve toxins. Because T. psyllae from western Europe is morphologically indistinguishable from the so-called native T. insidiosus, it is likely that the Trechnites species found in North America is T. psyllae. It probably colonized along with pear psylla during the 19th century. This would be consistent with collection of T. insidiosus in California before its intentional importation and release. Trechnites attacks pear psylla, its only host in orchard environments. The egg is laid inside the host and is about 1/250 inch (0.1 mm) long. There are two larval instars. The mature larva is about 1/16 inch (1.5 mm) long. The pupal stage occurs in the body of the host and is roughly the same size as the fourth instar psylla. The adult wasp is predominantly black with yellow legs and has a distinctive iridescent blue patch on its back. It is about 1/25 inch (1 mm) long. Pear psylla mummy attacked by Trechnites sp. The parasitoid overwinters as a fully developed larva inside the host mummy. The larva pupates in early spring, and the adult wasp emerges from the mummy around bloom time. The race of Trechnites in the Northwest reproduces parthenogenetically (asexually) and males are rare. Females of the spring generation search for psylla nymphs on buds and flowers. Females of later generations search both surfaces of the leaves and up and down the petioles. Upon encountering a psylla nymph, the female wasp taps it with her antennae and may sting it and lay an egg inside the host body. 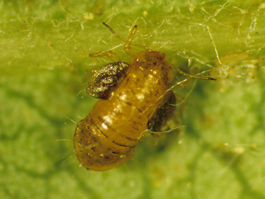 As the second instar larva reaches full size (10 to 20 days after parasitism) it devours the internal organs of the psylla nymph and the nymph becomes mummified. The mummy is characteristically shiny and pale brown. It is about the shape of an engorged fourth instar psylla nymph. In summer generations, the mummy forms on the leaves and small branches. Parasitized psylla nymphs of late summer or fall crawl down from the leaves, often into bark crevices, before transforming into the immobile mummy. There are 3 to 4 generations per year. Monitoring the activity of Trechnites is difficult because of its size and biology. Yellow sticky cards may be of some use to detect adults, but the relationship between trap catch and parasitism rate has not been established. The only reliable method is to dissect psylla nymphs under 30- to 50-power magnification. Such dissections are too tedious to be a useful field management tool. However, a relative abundance of characteristic psylla mummies on the leaves give an idea of the presence and activity of this parasitoid. Trechnites is known to be easily killed by most synthetic insecticides commonly used in pear orchards. Only insecticidal soaps and oils, species-specific pheromones and microbial insecticides will not harm this natural enemy. Parasitism rates in unsprayed orchards can reach levels of 70 to 90%, and season-long averages of 50% have been observed in orchards using soft pesticide programs. However, even high rates of parasitism may not prevent pear psylla from causing significant damage. Although Trechnites alone may not provide sufficiently high levels of biological control, their activities will augment the effect of other natural enemies.